"This dish is a favorite at potlucks." Preheat oven to 325 degrees F ( 165 degrees ). Mix together chicken, celery, lemon juice, chopped onion, toasted almonds, mayonnaise, sour cream, and grated cheese and place mixture in a lightly greased 9x13 inch baking dish. 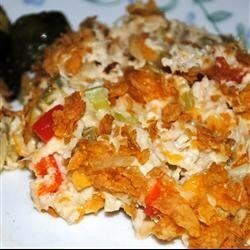 Top with crushed corn flakes. Bake in preheated oven for 45 minutes to 1 hour, until heated through. This was really good, but it had a little too many almonds and a little too much celery for my taste. Tasted pretty good - but too much celery. I did my own creativity by putting in some chopped onion, water chestnuts and some salt and pepper....I thought the recipe was a good base to start with and then take it to the next level. I used a little less celery and lemon than the recipe called for. It was great. As Rachael would say "yummo!!!". Family gobbled it up...woldn't change a thing!! Served it with yummy salad greens and strawberries topped with a poppyseed dressing. Fabulous! This was very good- somewhat rich but it was gone in no time! I don't cook and this was simple enough for me!! Excellent! I followed the recipe to the T and it was perfect. The celery is a must have. And it stays crispy! It's even good cold! A keeper for sure! GREAT recipe. We loved it. Thanks!! !